Listen, onion rings are objectively amazing, and if you don't agree with me, you're wrong. The only way this perfect food is made even better is by subbing the panko/breadcrumb/batter crust with crushed Nacho Cheese Doritos. Use sweet Vidalia onions, as they complement the salty chips quite nicely, and bake rather than fry, because you don't need oil to achieve a supremely satisfying crunch. Preheat oven to 450°F. Grease a baking sheet with cooking spray. Slice onions into 1/2-inch circles and separate into rings, keeping only large, whole rings. You should have about 12 to 14 rings. Dip onion rings one at a time into the eggs, then flour, then eggs again, then chips. 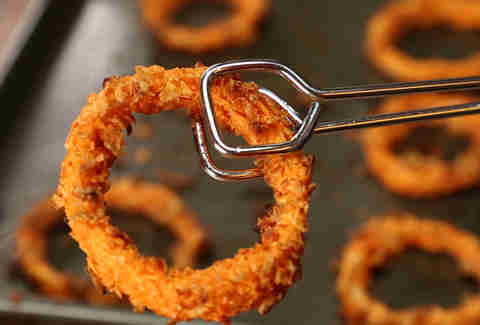 Place onion rings on the baking sheet, spritz with cooking spray, and bake for 20 to 25 minutes, or until crisp.